Emma Gardner, Rachael Wellisch, Rebekah Evans, As We Unfold, installation view, The Pod, Brunswick Mall, Brisbane. Photograph by Rachael Wellisch. Public space is a challenging environment for even the most experienced artist. Whether it’s a large-scale sculpture, site-specific participatory work, or political paste-up, the public realm offers a particular set of considerations, many of which emerging artists may not yet have encountered in their practice. So where do emerging artists learn how to work within the public realm? A recent performative drawing that played out over three days in a Brisbane mall, explored this question. A collaboration between emerging artists Emma Gardner, Rachael Wellisch, and Rebekah Evans, As We Unfold was installed in The Pod, a programmed creative space provided by Brisbane City Council. 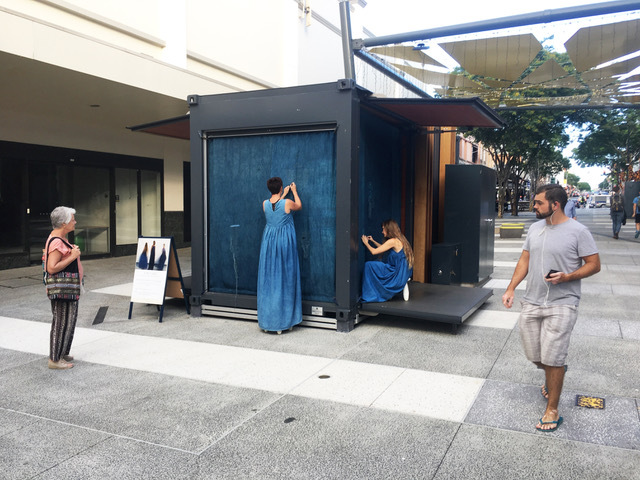 Located in the Brunswick Street Mall, the work involved the three artists slowly unpicking sheets of indigo-dyed hessian to reveal a collection of abstract marks. With the material enclosing three open sides of a converted shipping container (The Pod), the installation provided a walled space from which the artists worked, painstakingly perforating the boundary between them and their audience. Emma Gardner, Rachael Wellisch, Rebekah Evans, As We Unfold, installation view, The Pod, Brunswick Mall, Brisbane. Photograph by Thomas Oliver. As We Unfold began with the artists working within the installation, concealed from view. Likely there to avoid working in the sun, the lack of visibility meant there appeared to be no performance. The audience (curious passers-by) seemed bewildered as they saw nothing to match the marketing collateral surrounding The Pod. Quickly observing viewers’ reactions, the artists responded by relocating to the outside of the structure to work. Although this shift made the performance more visible, it posed the question, how much should an audience influence a work? Of course, the answer to this depends on the artist, audience, and other contextual elements. But, in this circumstance, where the artists appeared to prioritise the audiences’ needs over their intentions, the decision seemed influenced by the context. In a gallery, where protocols legitimise an artist’s process regardless of how anti-audience it might appear, would the artists have appeased the audience so willingly? Visually the work evolved slowly in the transient public space. As the first day of the performance came to a close, the hessian held only minor markings from hours of labour. A pace uncommon in a thoroughfare such as the mall, a slight tension could be felt as the work challenged viewers’ expectations of both the mall and contemporary art. A common response to public art, this tension often results in negative public opinion that puts pressure on councils to fund more populist projects. While it’s important to support a diversity of projects, it is also important to offer moments accessible to all that challenge and inspire new ideas. Both this project and Council’s Pod provided the latter. While over time the piece came to reveal a beautifully intricate surface of marks, the real delight was the women who in their trailing pinafores and bare feet, seemed to embody a youthful openness to their work as a site for learning. Engaging with some of the social, cultural, and environmental factors that define public space, the piece provided experience and insight for both artists and audience. Aptly named, As We Unfold is sure to continue shaping both its artists and audience as it continues to evolve through future iterations in other public contexts. Jenna Green is an emerging arts writer and facilitator in Brisbane, Queensland.